The Port Coquitlam location was a new business start-up, which means on day one the store had zero clients. John has had to draw on his entrepreneurial powers to help it get off the ground. Jon says his education from Douglas gave him the knowledge, skills and tools he needed to kick-start his career in banking. Before Jon came to Douglas, he was a manual labourer at a cabinet manufacturing plant and a shipper-receiver at the now-defunct Eaton’s department store. A people person by nature, Jon hated the work and wanted a change – he just wasn’t sure what. Then two things happened almost simultaneously: he came to Douglas to study commerce and business, and he got a part-time teller position at RBC, one of Canada’s biggest banks. “When I came to Douglas, I didn’t know what I wanted to do, but I knew I wanted to work with people, and for most of those opportunities you need to be educated and you need to explore and develop your skills. 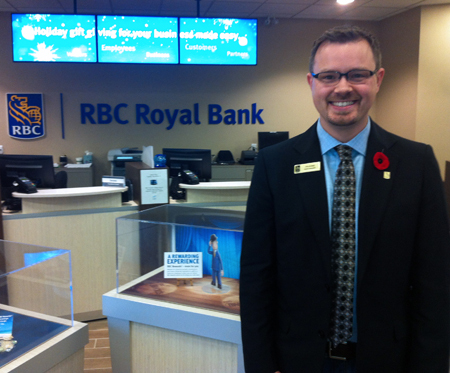 He’s been with RBC ever since, as a teller, salesperson, assistant branch manager, and now as RBC Retail Store branch manager. He remembers Douglas as a “melting pot” of diverse cultures and ethnicities and of younger and older learners. He says this left a big impression on him as he entered the corporate world. Did you know you can get a Bachelor of Commerce and Business Administration at Douglas? Find out more on our website, or come to an info session Dec. 4 (Coquitlam) or Dec. 5 (New West).